The Nagaland Tribes Council (NTC) termed the Chief Minister Neiphiu Rio-led Nagaland Cabinet’s belated decision to oppose the controversial Citizenship (Amendment) Bill (CAB), 2016, as “mockery” in the backdrop of ruling NDPP’s Lok Sabha MP Tokheho Yepthomi voting in favour of the Bill in Lok Sabha. Addressing a public rally organised against the Citizenship Bill at Kohima, NTC spokesperson Theja Therieh said the NDA government at the Centre bulldozed the Joint Parliamentary Committee (JPC) by getting the latter’s clearance and passed the Bill in Lok Sabha. The Citizenship Bill was passed in Lok Sabha on January 8, 2019. Alleging that hectic lobbying was going on to pass the Bill in Rajya Sabha by bringing in a supplementary Bill, Therieh said even if the Bill fails to get through in Rajya Sabha, it would be brought through an ordinance by the Centre and no one can stop them. He said “the State has no moral right to tell Government of India that we are not for it” as the Lok Sabha member voted in its favour. 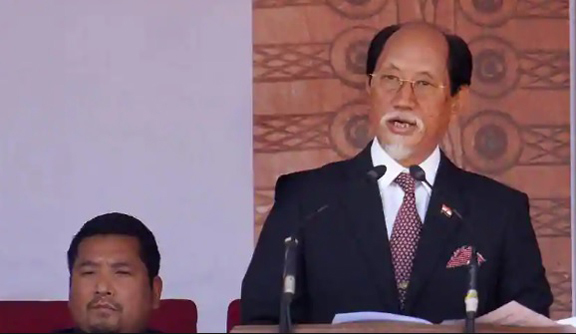 Therieh maintained that if the Citizenship (Amendment) Bill becomes a law, protective legislations like inner line permit (ILP) and Article 371 (A) would not be able to protect Nagaland. The NTC leader said the Nagas could not raise their voice due to divisions and trust deficit even as the neighbouring states were burning in protest against the Bill. He appealed to the Centre to cover the entire administrative jurisdiction of Nagaland, including Dimapur, under inner-line permit. “Unless this is done, nothing would happen as the state government was still was sleeping over it,” he added. Therieh called upon the ‘‘sons of the soil’’ to wake up, stand and protect their privileges. On Naga political issue, Therieh regretted that it had been 21 years since the negotiations had begun, and yet the desire of the Nagas to bring all groups together to the negotiation table as one entity had failed as the Nagas were not united and different groups had their own vested interest. He asked what had stopped the Centre to sort out the differences and sign a final agreement when eight Naga National Political Groups are in the peace process and the negotiators had reached a level of understanding. Therieh also reminded the Centre of its promises of bringing in a solution within 18 months and “election for solution” and asked New Delhi not to give false promises.